For ever and a day it has been the dream of Lotus Notes developers to be able to “modernize” their notes client applications and provide their clients an interactive user interface which is similar enough to the notes view interface to seem “familiar” but it different and “cool” enough to help them make the decision to modernize. I believe EXTJS used correctly, provides that user experience and compelling business demands to upgrade. A view panel does not look like a notes view. It does not function like a notes view. It really doesn’t provide the user with a simple way to find their data in a large set. A repeat control is better….well it should be from the user’s perspective, but is it really? It is actually harder for the developer to create a repeat control, but at the same time is more flexible than a view control to create a custom layout which meets the users requirements. But does it make a better user interface for the user ?- not unless the developer is also a graphics designer. Just take a quick look at grids in the http://dev.sencha.com/deploy/ext-4.0.0/examples/ library, I will wait for you………don’t get distracted by the cool charts, tabs, windows, layout managers and all that stuff your users don’t care about (riiight) let’s at least stay focused on the grids. If you came back from that not being impressed by the examples then you need to either look again stupid, or walk away now. 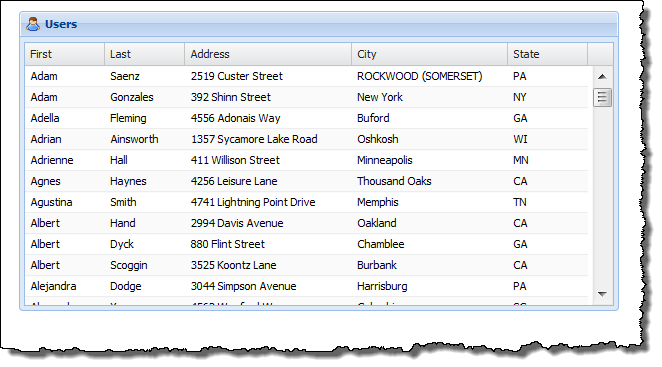 In this series of articles I am going to show how some of the EXTJS grids can be easily used in XPages applications by simply looking at the examples and then applying what we know about them and XPages to implement a grid within the XPages environment. ← Where did my wordpress blog go? And how can I fix it? I am really looking forward to this, thanks Mark. Excellent, Mark! My task for the weekend was to sit down and figure out the exact same thing! Seeing how grids worked at Connect-o-sphere was one of the best things about the conference (though third to jQuery and karaoke). So, expect plenty of repartee, witty or not. Sorry guys, looks like I missed hitting the post comment button. 🙂 Anyway, Rich Waters and I have been working on a project called Extnd since ExtJS version 1 and are in the process of now converting it to work with ExtJS 4. You can find out more on our github site > http://extnd.github.com/. Mark – Great post. Looking forward to more. Let me just suggest that in addition to comparing EXTJS to XPages Core Controls you also compare it to features in jQuery and Dojo. The EXT JS demo site looks great. But I guess I’m wondering what that has that jQuery doesn’t etc… I’d be worried about having an app that uses Dojo, jQuery and EXT JS. So any comments you have on that as you go would be great. Looking forward to this Marky. Above you mentioned the viewPanel and Repeat controls, but what about the Data View (xe:dataView)? It’s a little bit tricky to get going on but does pay back with what it can do for the presentation on view data. On the EXTJS I saw your presentation on EXTJS grids in your session at connectophere and I was impressed. The usability and user experience is very good and this is only thing that is not always to the fore. Paul, yes I always forget the DataView! I’m looking forward to getting some knowledge from you. As the guy who wrote the chapter on Views in the Extension Library, what about those? There are pros and cons of all. They may not be appropriate for all requirements, but some like iNotes List View offer closer fidelity to Notes Client, Dojo Data Grid is also available and the Data View is an off-the-shelf view control on steroids. You’ll find that using EXT, now Sencha, translates its api directly to “Sencha touch”. So investing time here will also help you go mobile a lot faster. Its a good framework, very mature and stable. The ExtJS grids look like they provide similar functionality to the DevExpress grids that some of our guys have used on .Net projects. Looking forward to seeing how you get on with this.